Through the work and dedication of the Religious Education staff at St Mary’s College, students are taught within a climate conducive to their intellectual, spiritual and moral development. The Religious Education program is a primary focus of the life at the College. Each student at the College participates in formal Religion classes using the Faithful to God; Faithful to People Program. This curriculum is divided into five strands of content. From Year 7 to Year 10, topics within each of these strands are undertaken. The depth covered in each topic is geared toward the emotional and spiritual development of students in that Year group. 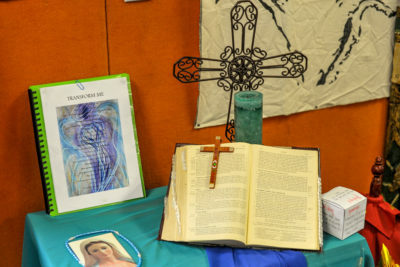 In Years 11 and 12, students participate in the Board- developed course, Studies of Religion. This course examines a range of religious traditions but maintains a strong Catholic focus. Various activities are undertaken within the College, under the auspices of the Religious Education Department, designed to complement the formal curriculum taught to students in the classroom. These activities lead students into a personal experience and practical application of the content taught in the classroom. Classes pray together during roll call to begin each school day. Students are also given regular and varied experiences of both individual and group prayer within their Religious Education classes. Retreats and Reflection Days are vital to the life of the Religious Education Program at St Mary’s College. These retreats and reflection days are compulsory parts of the religious education program and enhance the formal curriculum. The Religious Education Department at St Mary’s College seeks to develop in students an awareness of those in need within both our local and wider community. Faithful to this aim, students are encouraged to become involved in some charitable works. To provide opportunities for students to grow in a personal relationship with Jesus Christ. To make students aware of Catholic spiritual heritage in the areas of liturgy, doctrine, Scripture and prayer. To help students to live in such a way that their actions give living expression to their faith. To give students experiences in participation in the prayer life of the Church – in the Mass, the Sacraments, and Devotions.